Double-hung windows offer a traditional design that adds symmetry and balance to any room. Designed to perfectly complement walkways, porches, patios, and high-traffic areas, Renewal® double hung windows offer a wide glass surface area. And because double-hung windows open up, instead of out, they don’t take up exterior space and can complement both traditional and contemporary homes. 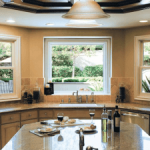 If you are looking to significantly change the dynamic of your living space through the windows of your New Jersey or Philadelphia home, the double hung windows from Renewal® by Andersen of Greater Philadelphia are a great and practical choice. The room you choose to have the windows installed will immediately look brighter and more spacious, without the need for actual new space, and will simply be more welcoming. Renewal® double hung windows tilt inwards for simple maintenance. The inward tilt allows you to clean the window inside and out without having to leave your home. Once titled back into place, double hung windows from Renewal® boast a weather tight seal that will protect your home and your investments from water damage. The same seal eliminates drafts and provides you with a more energy efficiency year ‘round. You won’t find windows not produced by Renewal® that offer such a wide range of benefits for homeowners in the Philadelphia and Camden NJ area. Windows like these can only come from a company who has more than a century of manufacturing experience. And for proper, factory certified installation of these high quality windows in Philadelphia, Camden NJ, Havertown, and the surround towns, you’ll need to turn to the exclusive supplier of Renewal® windows to the region- Renewal® by Andersen of Greater Philadelphia. Our expert window installation services in NJ and Philly ensure that the double hung windows you choose will look just right for your home. The windows’ design can be customized to fit the space exactly without heavily compromising the overall structure or design of your home. You can request a free window or door consultation and receive additional information about our products by calling our toll free number 610-563-2190. Call today for Philadelphia area replacement windows and doors from a company you can trust!